As a general rule when purchasing garden buildings, you get what you pay for. Your budget will ultimately govern the quality, size and features that you can consider. However, it is important to remember that while choosing a cheaper option may seem like a good idea in the short term, a higher quality garden building will wear better and last much longer. 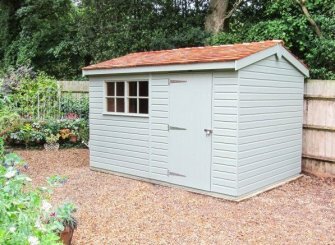 With the resultant reduction in maintenance and repair costs, a Garden Shed from us becomes a long-term investment. This can prove to be a particularly lucrative one if you ever consider selling your home. Here at Crane Garden Buildings, we take pride in only using the finest quality materials, which guarantee longevity and craftsmanship that a machine simply cannot deliver. We are not interested in building you a shed for the summer, we build sheds for life. We specialise in building timber Garden Buildings, however, other materials such as aluminium or plastic are also available. You should be aware that metal ones can create condensation on the inside in extreme weathers. This can damage contents and plastic sheds, while durable, are not always the most attractive looking or comfortable option. It must be mentioned at this point however, that there are no right or wrong choices - it is simply a matter of preference, purpose and budget. Consider the size of your garden and the amount of space you have available. Select a size which is suitable for your needs - too small and you won't have enough room - too big and you will lose more of your garden than is necessary. Be aware of planning permission requirements also - most garden buildings are considered permitted development and all of our buildings comply with regulations, therefore should not require planning permission. However, there may be additional restrictions depending on your property and location. Read more about planning permission in our related article: Planning Permission for Garden Buildings. Soft, quick growing woods, such as birch are able to provide large quantities of cheap timber. This may seem like a good way to save costs, but there is always the risk of this being balanced out with the cost of upkeep. We only use FSC® certified, slow growing pine, sourced from Northern Sweden, close to the Arctic circle, selected especially for its strong, knot-free nature. All of our garden buildings are also treated with our standard Light Oak preservative. This lets the natural quality of the timber shine through, whilst warding off damage from woodworm and fungi. If the joinery of a garden building has been poor, it will become evident quite quickly - the roof may sag and panels may become misaligned, leading to doors or windows not closing properly. This could compromise not only the structure, but the security of your garden building. Do the floorboards or walls flex if you apply pressure? Are there gaps in the wall panels? Every component of our garden buildings are hand-constructed to order, at our in-house joinery in Norfolk, by our team of expert craftsmen. This means that each element of your shed, Summerhouse, Timber Garage, Garden Studio or Garden Room will be custom made with you in mind, to the highest possible quality. Take a look behind the scenes, at our Norwich headquarters in our short video. When investigating garden sheds, check that specially toughened glass is used, as ordinary, horticultural glass breaks easily. Not only can replacements be costly, but it is also a hazard, especially if you have small children that play in the garden. The roof is the first line of defence against weathering, so it pays to make sure that you have the best quality possible, particularly against our notoriously wet UK weather. The roof should be solid, strong and ideally not made from materials such as chipboard or strand board (OSB). These can sag and deteriorate very quickly, especially if penetrated by moisture. We use high quality, mineralised roofing felt, cedar shingles and slate effect tiles, which can last anywhere between 25-35 years. To avoid corrosion or damage, ensure that all door furniture and ironmongery is either galvanised, zinc plated or made of brass. You should ensure that the timber bearers that support the floor of the building are pressure treated, as well as being spaced sufficiently to support the floor. You should consider how you will use the building and what you intend to store within it. If you intend to use frequently, perhaps as a workshop, social space or office/work space, then you should even consider heavy duty flooring as this will offer even more longevity than a standard strong timber floor. Here at Cranes, our standard flooring is 19mm thick and our heavy duty flooring is double this, at 38mm. Heavy duty flooring is an extra we always recommend to our customers, especially those who intend to store heavy items or machinery (ie. ride-on lawnmowers) or if use it daily, as this will double the lifespan of your flooring. At Crane Garden Buildings, we will listen to your requirements and thoughts every step of the way, and advise accordingly. We recommend all of our prospective buyers to visit one of our seven National Show Centres, positioned throughout the UK. This will also give you the chance to have first-hand advice and information from our dedicated team. There are several ways to get in touch with us, you can Request a Callback, Contact Us or call a member of the team directly on 01760 444 229.